At a time when Flash prices declined, crushing Sandisk's margins, FIO's margins only increased by 1% from the last quarter. 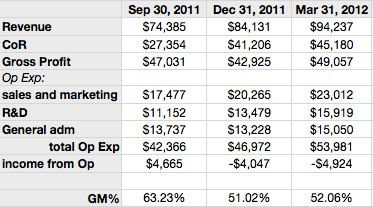 Seeing how well AAPL was able to increase their margins, I was expecting FIO to do north of 55%. Maybe the high 50s, considering FIO saw gross margins in the 60s in Sept 2011. The revenue indicated strong demand for their products, but there is an inconsistency here. The macro trend of flash is not jiving with FIO's results. Investors got the answers in the Conference Call. Management indicated that they passed along the savings to their costumers. They sold more product for less, which means the lower hardware sales could not be offset by the software. Whats a real pisser is that management indicated that for every 10% decline in flash price should lead to a 150-200 bases point increase in gross margins. This quarter showed investors their business model is now shifting, and more dependent on software. Its a shame. If FIO stuck with their original business model, this quarter should have been a blow out. Most likely they were getting too much pressure from their 'partner' venders to sell at a lower price point because the competition was using the lower price point (no pricing power). Either way, it will now take longer to get to real (balance sheet expanding) profitability. I am going to shy away from trading this one until I get better clarity.